Analyzing population health management (PHM) efforts is complicated. Many of the measures that are top-of-mind for health systems and other organizations are centered around the need to report on their population health management efforts so they can get paid. 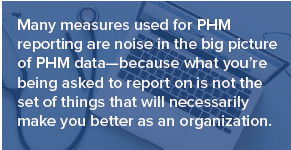 These requirements are unavoidable, but are “noise” in the big picture of population health management data—because what you’re being asked to report on is not the set of things that will necessarily make you better as an organization . Or even if it is, the measure is an absolute outcome measurement, not something that helps you understand how to improve what you do. Many measures also only assess the clinical services delivered, ignoring the social and behavioral factors negatively impacting patients that may need to be addressed before any improvement from clinical care can be realized. It is incumbent on you to dig into and find information that will tell you how to treat the patient in a holistic way—what specifically to do, how to do it, and what you should improve upon to meet the test of this broader, less specific outcome. That signal in the midst of all the noise is critical, and you will need to analyze, measure, report, and act on that signal if you hope to make a difference for these less specific outcomes. For example, a key measure for a diabetic population is a standard HEDIS measurement for controlling HbA1c levels. This measure helps you understand whether the portion of your diabetic population able to keep their levels under control is growing or shrinking, but it doesn’t give you any insight into how diabetics can best control their HbA1c levels or what other factors may be causing the issue so you can develop the right treatment to improve outcomes. Just taking a measurement doesn’t tell you anything about the population you’re serving or the techniques needed to help those patients adhere to their care plans. It offers no insight into how often and how intensely you need to interact with the patients so their conditions remain under control. You’ll need to figure out these factors on your own—by measuring, analyzing, and improving the specific techniques you use to manage care for the population. These factors are totally missed if you jump straight to a specific health outcome. Insist upon process measures—those that measure the efficacy of care coordination actions you choose to do and the interventions you employ. Insist upon measures that assess the effectiveness of the care teams you put together and the different components of care that that team represents in the lives of your patients and populations. Insist upon measures you can trend over time to understand if the composition of care delivery methods, care partners, and patient interactions are leading to better health outcomes in aggregate or not. These measures will enable you to perform population health management analytics and draw insights from your results so that you can take your best practices and deploy them as real protocols. This will help you bring predictability and assurance to your value-based care efforts so that the care you deliver will improve outcomes for the next set of patients that cross your threshold. To move the needle on population health, you have to look for those things that are going to make you better, not just the things that will tell you if you’re good enough.